Details: Shingling pattern in gable apex on east and south elevations; window trim and crowns. Historic Features: Full front porch; two gable dormer bays on north elevation; gable-el bay and dormer on south elevation. Exterior Alteration Permits: 06FRA0000000103, replace chain link fence portion with spaced wd picket fence; 13ROOF-0093, Tear off and replace shingle rf. 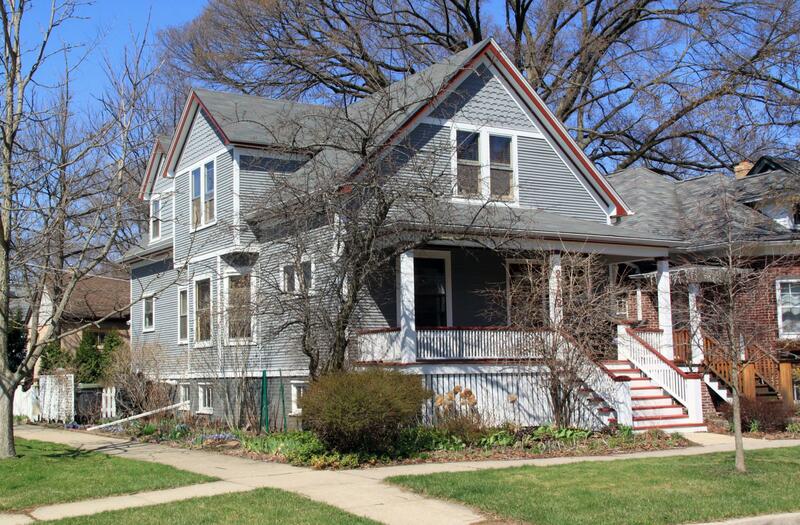 COA Info: 13PRES-0061, tear off existing 3-tab asphalt shingles and install new plywood and new 3-tab shingles to match existing; 08HIS0000000014, replace 8 basement wd windows with new wd windows with 2 mullion design, new windows will be recessed as per the depth of the existing windows; 06HIS0000000127, replace chain link fence with a new 4'' high wooden picket fence on same location (south side yard of corner lot), new fence must adhere to the Certificate of Zoning Compliance 06-0670-BP(F)-2.